Chandratal Lake is growing its popularity among the youth in India with each passing summers. Now, families with kids have also started showing interest in making a trip to this pristine lake in Spiti Valley. And why not, as the distance from Delhi looks like Chandratal lake is just a couple of days away only. However, like someone said, “not everything that glitters is gold” and so is the trip to Chandratal lake. All these novice travelers or adventure lovers forget that Chandratal lake is located at an altitude of 14000 feet in Himachal Pradesh tribal belt. This much altitude is more than enough to make you sick of acute mountain sickness. 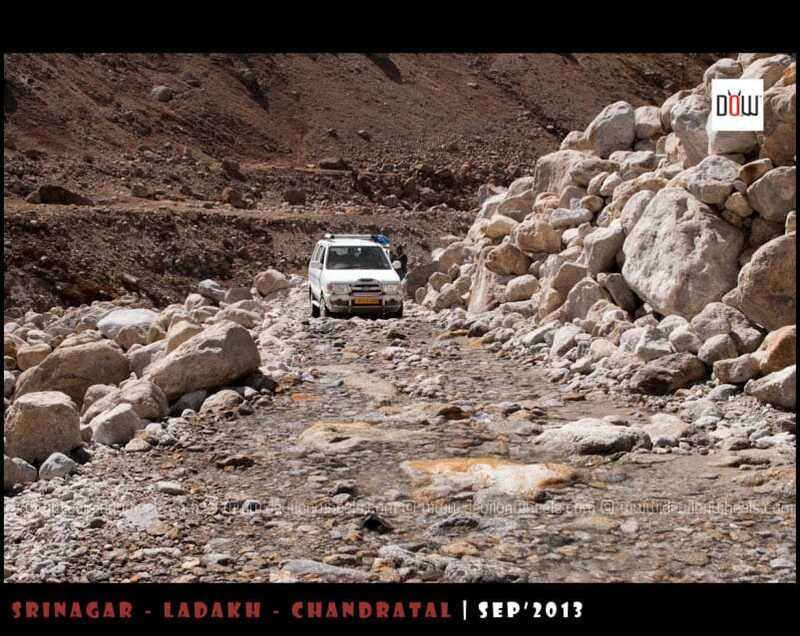 Even the road to Chandratal lake from Manali is one of the worst roads you will ever come across in your life. It feels like as if you are driving on a river bed and dodging the furious water crossings every few kilometers. Download your FREE high-resolution version pdf copy of this most common itinerary for Chandratal trip day by day plan infographic guide. If you like it and find it helpful, please feel free to share it with your family and friends to help them too. Traveling to Chandratal from Kinnaur side? 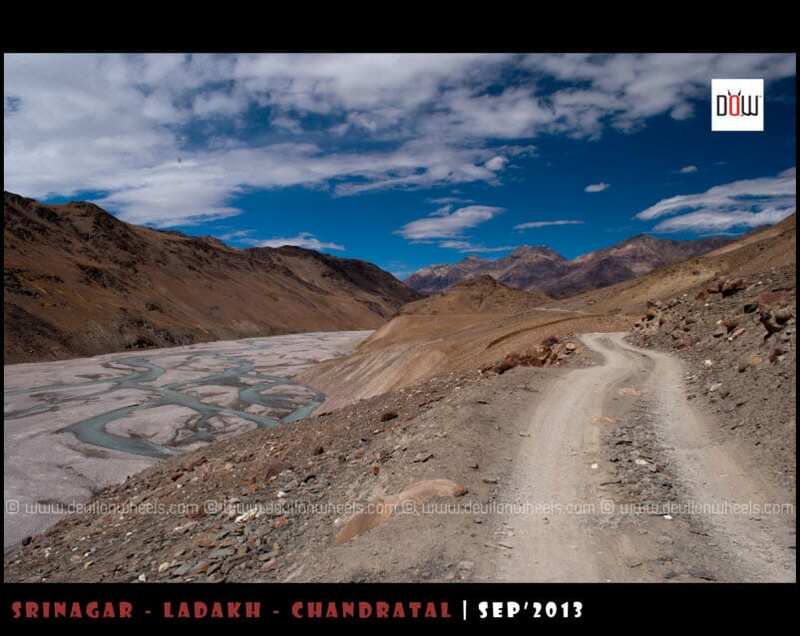 Can I make a trip to Chandratal in 4-5 days from Delhi? 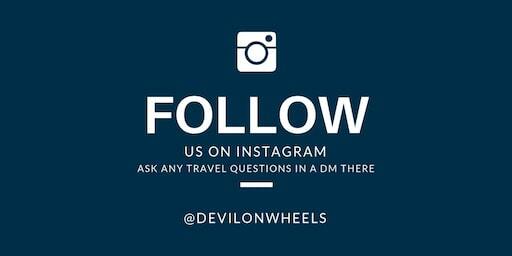 Can I make a Delhi to Chandratal trip in 3 days or extended weekend? 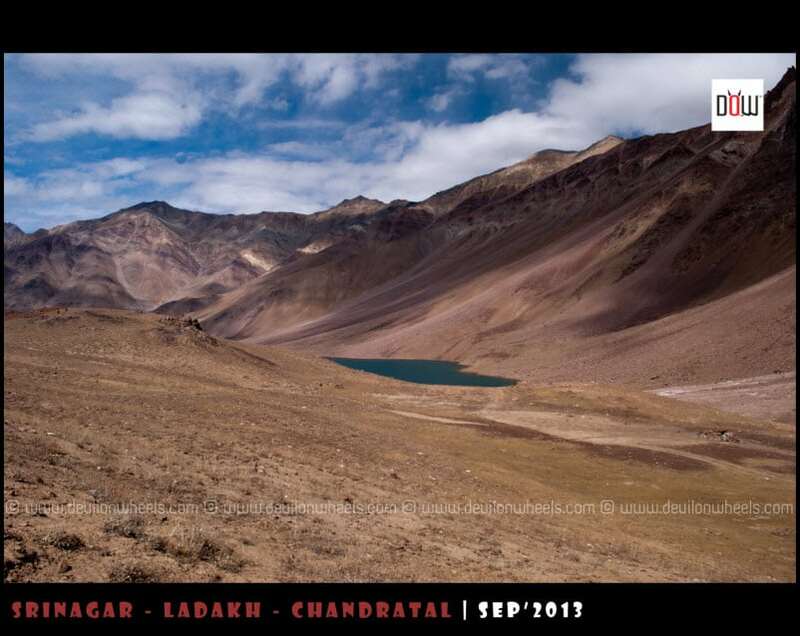 In this article today, I am going to share a most common itinerary for Chandratal lake. This itinerary keeps distance to travel in a day balanced and to an extent also considers acute mountain sickness issues. You might have read my detailed travel guide of Chandratal lake at the link Delhi to Chandratal – Travel Guide. 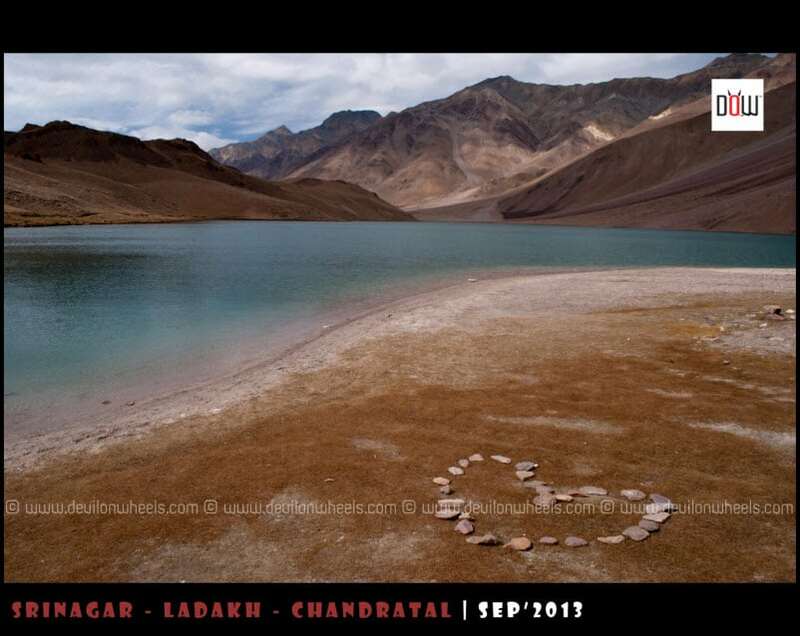 If not, then please read this travel guide so as to know more in detail about Chandratal lake. You must be aware of details about the regions and what it offers on any adventure trip. It helps you be prepared for the unknown in such remote locations of Himalayas. If you are coming to Chandratal lake from Kinnaur side, there isn’t much to worry about AMS as your body will be acclimatized. In this article, I am talking about making a trip to Chandratal lake from Manali side because of less number of days at hand. 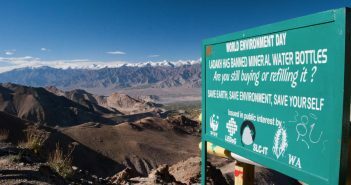 This plan does not cover Spiti Valley and is limited to a visit to Chandratal lake only. 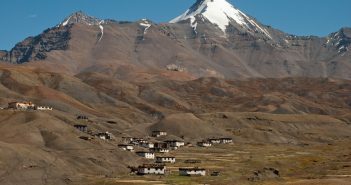 In case you are interested in making a trip to Spiti Valley, then better refer to my article on planning a Spiti trip from Manali side. Before going on a trip to any high altitude region in the Himalayas, I always urge everyone to read the article on Acute Mountain Sickness and Importance of Acclimatization. Please keep in mind that in case you are planning the trip from Manali side, you can never avoid AMS issues. Camps are about 1-1.5 KMs from the Chandratal lake. You can either stay there if you felt good the previous night or be back to Batal (preferred) where there is a PWD rest house now though without electricity. Unless you want to stay in a guest house with electricity, better stay at Batal and save time as well as energy for the next day. Thankfully there are no concrete buildings near Chandratal lake and only a few temporary camps run in season time at a designated camping site near the parking lot. You can get in touch with Bishan Thakur – Parasol Camps & Retreats at 09418845817, 09459910098, Nawang: 09459073908, 01906-200204. You can also write to them at [email protected], [email protected] These camps are more spacious, have mattresses & quilts and decent comfort. He does have a dining area & covered washrooms if required. There are a couple of other camps too nowadays. Well, at Battal you can stay at Chandra Dhabha run by Dorje Uncle. It has a shed like room for 7-8 people. Most of the space where food is served is occupied by workers and the Dhaba family itself, so if you are lucky you may get space to sleep there as well. They charge Rs 125-150 per person for a night stay and provide quilts as well. You can take as many quilts as available with them and if not in use by anyone. Best is to have your own sleeping bag. There is a PWD Rest House as well now at Batal but without any electricity. You can take rooms there and eat at Chandra Dhabha with Dorje Uncle and Aunty Ji. 08991722020 is the contact number of satellite phone at Batal and you can inquire from Dorje uncle if he can book a PWD Rest House room for you or couple of igloo type huts just in front of his dhabha that can save you from cold winds in the evening or night. Dorje Uncle’s son Tenzin now also set up camps at Chandratal, you can reach him at Tenzing Camp – +91-8991722020. Else call up the satellite phone and ask Dorje uncle to do the bookings for his son’s camps. Well, as we read in this article that it is possible to make a trip to Chandratal lake in 5 days from Delhi. It will give you enough time to relax and enjoy this beautiful wonder of nature in the remote corner of Himachal Pradesh. You can get connected directly to some taxi drivers in Spiti Valley or Manali at the link: List of Taxi Drivers for Spiti Valley & Kinnaur Valley. The rates of the taxis are about Rs 11000-12000 depending on the number of days you plan to travel. Otherwise, taxis, in general, are also available on the spot from Shimla or Manali from respective taxi stands to most parts of the Himachal. At a minimum, you will need at least 4 days to visit Chandratal lake from Delhi. In case you are going to follow some insane AMS prone plan of taking the overnight Volvo from Delhi to Manali and then on the next morning of Day 1 reach Chandratal lake and rest up there. On Day 2, you can travel back from Chandratal to Manali and rest. Finally, on Day 3, you return back home from Manali to Delhi. Or you can do the other way round by reach Manali on Day 1 and rest for the day. On Day 2 reach Chandratal and sleep overnight at Batal or Chandratal and Day 3 reach Manali and take the overnight Volvo to reach home by Day 4 morning. If you ask me, I will highly suggest against both these travel plans for Chandratal. Still, if you want me to force, I will put my bet on second plan where you sleep at Batal on Day 2 after visiting Chandratal. If you know your friends or family are planning a trip to Chandratal Lake in 5 days, do share this article with them to help them make a memorable Spiti or Chandratal trip. 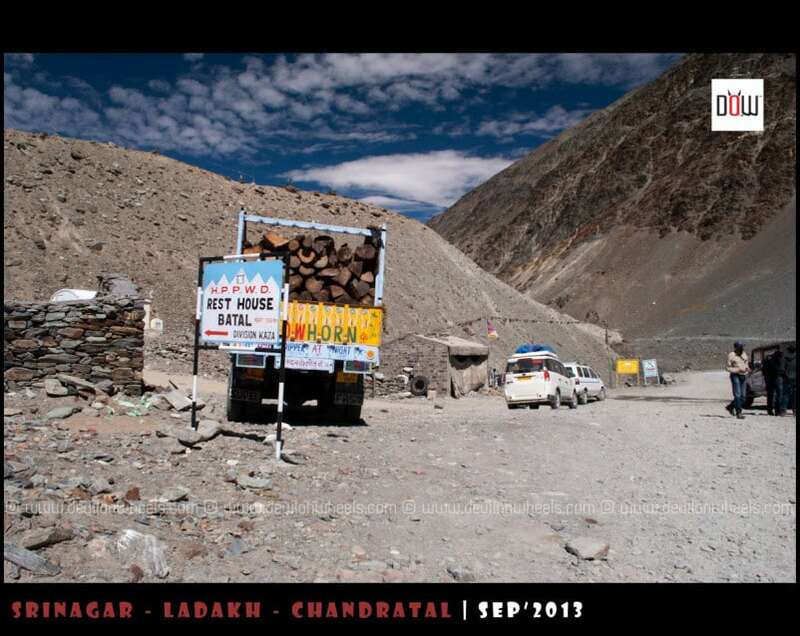 For a trip to chandratal and rest of the Spiti valley, I called multiple numbers of the drivers given in dow. We are 7 adults. Some of them told me it’s not possible to go with a sumo or scorpio with 7 people and luggage in these roads and I should book a tempo traveller and some told me sumo will be perfectly fine. So wanted some advice. I do believe that with 7 people and luggage it will surely be tough and should be avoided. Thanks Dheeraj. We have booked a 12 seater Tempo Traveller for 7 days @35k . Sounds fare or I have been duped ? I have already sent the advance. It sounds OK to me. Regular taxi costs about 3500 per day, so tempo for 12 is usually 35% more, maybe some 10% here and there. Plus less days costs more on per day basis as you cover the distance. However, just to be on safer you can also double check with a driver named Nittu at these numbers +919418344252, +917018346811, +919736464283. He does have a new tempo traveler too. And i’l be travelling with my Mom, just 2 of us. Manali to Chandratal can be done in one day. The road end is at the walking distance from the lake. 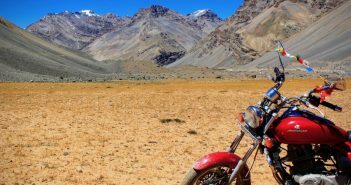 Ohh ok….Like on day 1 can i do Rohtang pass and then to Chandratal lake, spend some time there and then go to Kaza for a 1 night stay and leave next day (day 2 )to Manali from kaza? I replied to your other question. Hi Dheeraj, i have read all the articles that you have posted and i really appreciate all the information that you have provided all lf us with ! Can you share some insight on the road conditions during that time window as it’ll be the first time we will be driving on such roads. Delhi to Solang on 12th, stay for the night. Solang to Chandrataal site on the 13th with an overnight stay. And then 14th- Chandrataal to Manali followed by 15th- Manali to Delhi. Is it a good itenerary or we shall add another buffer day keeping the weather+road conditions in mind? Also is it advisable to get the Beyond Rohtang La permit online a month early? Really appreciate the time and efforts you’ve put to answer everyone’s query! Thank you Abhi !! Sorry for delayed reply, been busy with some stuff at the office in last few days. It will be peak monsoons, rivers and water crossings will be in spate. Upto Manali and Rohtang Pass, in case of rains, slush and landslides could be common. So, no silver bullet but it is a matter of taking a risk. You should have a buffer day in place. You will not get Beyond Rohtang PAss permit before 5 days of your travel, I think they have restricted it to get the permit 5 days before the date of travel. There is no much fuss about that permit, so you should be OK with 5 days in avdance as well. I visited chandrataal on 17th June weekend. The roads a pretty bad and virtually non existent. the major lot is so tricky that there is hardly place for 1 vehicle to go forget 2 requiring crossing each other. If you have never driven on bad roads, AVOID. Take a cab. Will save ur MUV & urself from over working. There are lots of nallas which makes it further difficult. I did the mistake of reaching chandrataal around 4 PM and climbing to lake same day. Managed with minor difficulty but spending the night became difficult. Blood oxygen levels went really low. Try consulting a physician on how to overcome that. However, its a beautiful place. All (senic) beauty and nothing else. Feels amazing. The climb was smooth and risk free. thanks for the insights. Me and my friends planning to go to Chandartal from Manali on Saturday 30th June 2017. Advice if that would be right time?? and also things we should carry with us. We are planning to stay for one day near Chandartal, hopefully will carry tents and sleeping bag. Kindly advice. I am visiting Chandratal lake next week and the post helped me with lots of information. Thanks for sharing! Best wishes for the trip Isha, feel free to post any further questions you may have for it. If you are looking forward to a very relaxing trip, then, in that case, it should be OK to stay at Chandratal and do the hikes around the lake, maybe even towards Samudri Tapu however with high altitude there could be a struggle. Regarding going to Kaza, I will suggest that on 14 you directly go to Kaza, 15 spend day at Kaza and explore Langza, Hikkim, Komic and then on 16 you reach Chandratal from Kaza, stay overnight and next noon start for Manali to reach by evening. Hi, we are a group of 6 persons looking for a stay at the camping site near chandratal , what will be the cost of tents at the camping sites. i need the working number of batal. 08991722020 is no longer in service and we’re planning a trip to chandrataal in the end of June. without that number, I’ll not be able to make a booking of camp as parasol camp is very very expensive. Lavish, no booking required from this year. You just to provide the required information to get the permit to travel beyond Rohtang Pass. Just ensure that you travel to Khoksar to make the entry to checkpost and then come back to Gramphu and travel to Chandratal or Spiti. Thank you so much Dheeraj, that is really helpful. We’re planning to book camps and Batal stay there impromptu(not booking earlier) – I hope that is not a problem. hello dhiraj. we are total a group of 25 ppl and planning for chandratal lake we are reaching Ambala on 13th july morning. from there how can we plan the dayz ? how many dayz should we plan for stay at chandratal ? we have 8 kids age 10 to 14 is is ok for them ?we are planning to take 2 bykes from manali is it ok ? we have return train tickits from chandighar on 20th morning 10 am. Kids of such age are OK to be taken as they can convey the inconvenience. You should refer the itinerary mentioned in the article above for planning the trip. If you guys have experience in riding the bike in such a terrain, it is OK to take it else avoid. Also, please note it is an adventure destination not a family or leisure vacation spot. You will go through some hassles and family, in particular, will not like the roads and bumpy ride. Since, it is a very large group, people might be prone to AMS in the group. We are planning to reach losar on 24th May 2017 from Shimla. Is that possible? Will the road open that time? Road from Shimla side will be open but not from Manali side. A group of friends (6-8people) are planning to visit chandratal around 12-13th June. We will reach Manali on 10th, acclimatise at solang valley on 11th, and head out towards chandratal on 12th early morning. We plan to keep a day in hand if anyone needs further acclimatising at battal. We plan to camp overnight at Chandratal and come back to Manali the next day. Manali does not help in acclimatization, so it is better to stay at Solang and Khoksar or Solang and Battal. You will have to take the permit for Rohtang Pass as you will be crossing it. In case you are hiring a taxi, then taxi guy will arrange the permit. I will advise you to hire the local taxi in Manali. Any way to reach Chandrataal if we are travelling to Spiti via the Shimla route in Mid-May? No Aaditya, you cannot travel to Chandratal in the month of May. I am planning a short trip to Chandrataal lake first week of June. I heard that roads are open. However is it a good time to do this trip ? Secondly can we camp there..I mean can we bring our own tents and camp. Or it is not allowed. If not then what’s the other option to stay overnight out there. We will take bullets on rent from Manali and go. Whosoever told you that roads are open gave you the wrong information. The road from Manali to Kaza is not expected to open before mid of June at least as per last reports. Camping is only allowed 1.5 KMs from the lake at designated camping sites. Thanks a lot Dheeraj for that update. Yeah i meant that only that the roads will be open by 1st week of June or so. I called up parasol camps and had a word with Bishan thakur… he told me that the roads will open by 1st week. It could be quite cold Sarin at that time of the year. Most of the camps wind up but since weather has changed a lot, keep a check with Parasol guys who wind up in the last. But, beware that it will be quite cold with winds at Chandratal in October mid. Is it possible to visit Chandratal from Manali via Rohtang during mid May (17th-18th May to be precise)? No, traveling to Chandratal lake is not feasible in the month of May.